PASSIVE | RESPONSIVE | ULTRA SMART is a combination of three mini collections created for Phoebe’s BA Hons graduate collection. PASSIVE explores stereotypical performance fabrics that address the primary instincts of the body - focusing on breathable and thermal properties. 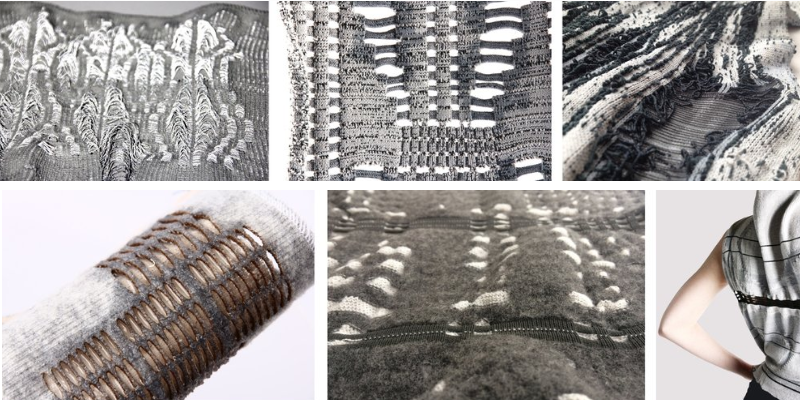 The knitted textile is designed to acknowledge a stimulus; so with PASSIVE BREATHABLE, the stimulus is high body heat production and the fabric is designed to ventilate. Combinations of yarns have been combined to explore their differing characteristics in a series of techniques. The fabrics are designed to move with the body - to be flexible, to be stretched, pulled, twisted and bent within their compartmental placement. As breathable fabrics, they are be placed on areas of the body with high heat production areas throughout general exercise to utilize the knitted textile to its full potential.. PASSIVE THERMAL explores the pocketing technique, stuffing knitted textiles with either goose down or polyester stuffing in specific purpose placement. The fabrics are located on areas of the body that will benefit from thermal insulation. The fabrics are majority felted, but they are not stiff and ridged, due to specific yarn combinations in order to adhere to second skin body movement. RESPONSIVE WATER REPELLENT fabrics respond to a change in environment, so they acknowledge a stimulus and respond to it. The performance properties in this collection focus on water repellent and reflective. The colour palette is designed to reflect the colours of rain, water and light. The collection is heavily based around coating applications. RESPONSIVE REFLECTIVE showcases a 850 micron reflective yarn sponsored by JRC Reflec. Its mesmerizing reflective properties have been exploited through needle transfer designs. The fabric is incredibly lightweight and the needle transfer designs are purposely designed in ways that will exploit the reflective coating on the yarn. ULTRA SMART textiles acknowledge a stimulus, respond to it, and then adapt accordingly to the environment. The collection showcases Merino wool blends and innovative performance yarn, Celliant©, that is an engineered infra-red yarn. Not only is it a thermo-regulating fabric, it increases circulation, increases tissue oxygen levels, increases the efficiency of respiration and aids with pain relief. The combination of the two performance yarns is to create a super-advance innovative textile.